On aerial runs, be careful of how much slack is needed between poles. In recent years, the cost of fibre optic cabling has dropped considerably. What used to be cost prohibitive is now readily available for even the smallest SCADA system project. Guelph Water depends on its SCADA network as a vital tool for its operations and compliance teams. The SCADA network is critical for complying with the 5 minute logging requirement for online chlorine residual readings outlined in O.Reg. 170 section 6. 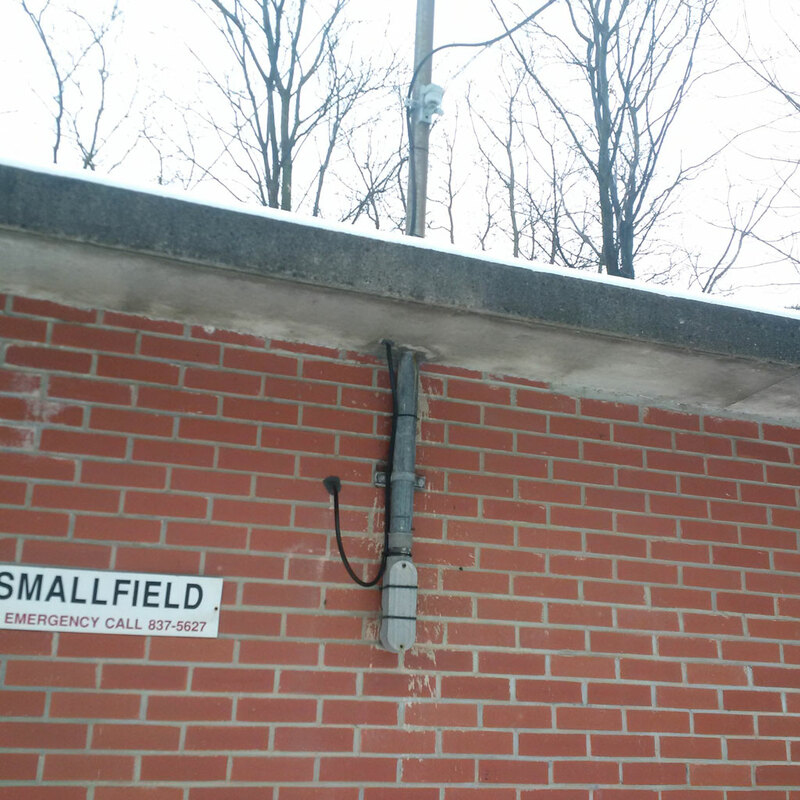 This past summer, the final segments of fibre network cable were installed to link several Guelph Water buildings. Optical fibres have a number of different applications, but in general the technology is used to send and receive information using only light. This method of communication has a number of advantages over regular copper wires. These include faster speeds, more bandwidth versus copper cables of the same size, no electrical interference between cables, and a lower chance of weakening or losing a signal. This not only means that fibre optic wires operate more efficiently than copper wires, but they are also cheaper to operate and maintain. This is especially true for long distance high speed Ethernet networks. Copper Ethernet connections are usually limited to around 300 metres, whereas fibre optic links can span over 100 km without the need for repeaters. Two types of fibre optic cable are typically used in Ethernet networks. The first is multi-mode and the second is single mode. In multi-mode fibre, a large diameter optic strand (50 – 100 microns) is used so that a low intensity laser transmitter can be utilized. This allows for less expensive transmitters to be used. In single-mode fibre, the fibre optic strand is very thin (8 – 10 microns) and requires a more expensive laser transmitter. The difference is that single mode fibre can be used to cover much longer distances. In the past, it was hard to justify the use of single mode fibre for anything but long distance applications, but now it is cost-effective for most applications. If a cable is being installed outdoors it will have a stronger jacket/armouring on it. Fibre optic strands are fragile and must be protected. In all fibre optic cables, the strands are arranged in plastic tubes to protect them. The use of armoured cable is recommended. If a cable is being installed outdoors it will have a stronger jacket/armouring on it compared to a small indoor fibre patch cable which may have only a thin plastic covering. When fibre is run for any length, within a building or underground, it should be protected inside conduits. 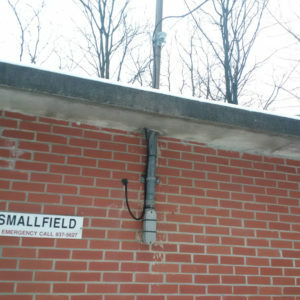 If it is run up the side of a pole, or on the side of a building, a guard, or a conduit, is recommended to protect it. When fibre cable is strung between poles, a messenger wire is needed to support the cable. In aerial applications, the fibre cable has to be fastened to the messenger wire using light-gauge lashing wire or special clips. For long aerial runs, a special machine is used to affix the lashing wire to the cable as it runs along the messenger wire. On aerial runs, one also has to be careful of how much slack to use between poles. Too much slack, and the wire will be thrown around in the wind and it will most likely be damaged. 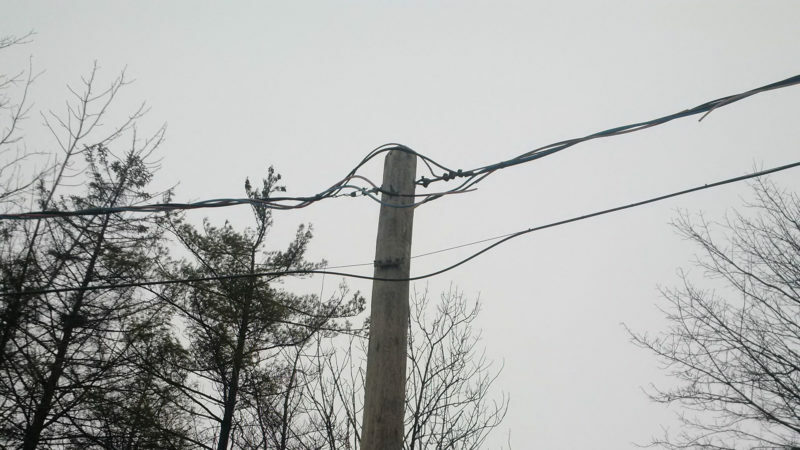 However, if the cable is too tight the wire will vibrate quickly in the wind, causing stretching and damage. Lastly, at the end of aerial runs, the messenger wire has be properly fastened so that it will not fall down. It is possible to purchase fibre cable that has the messenger wire moulded into it, but it is more common for the messenger wire to have to be installed separately. Terminating fibre cable requires special tools and equipment. 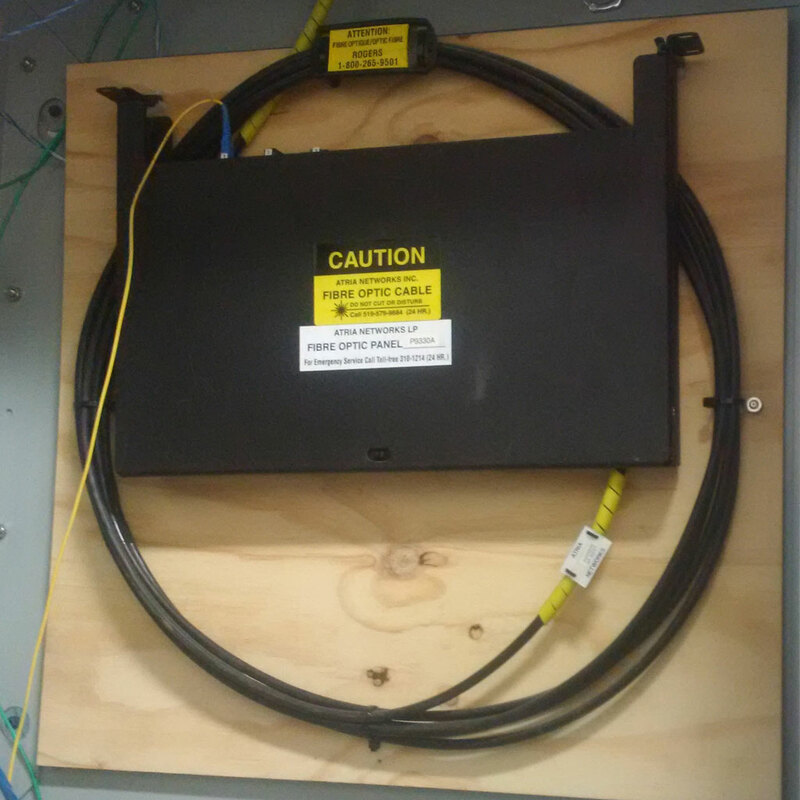 Best practice is to only do fibre terminations inside of a network cabinet or control panel. Special manufactured termination boxes are recommended that provide a means to safely secure the end of the cable and expose the individual fibre strands for splicing/termination. Inside a termination box, there are two options to terminate a fibre strand. The first is to splice to another cable and the second is to terminate it with a fibre jack. The use of fibre jacks is always recommended, as it allows connections from one fibre cable to another to be modified, using short fibre patch cables. Fibre patch cables are also used to connect a fibre jack to a piece of network equipment, such as a switch or fibre transceiver. Always leave several loops of spare cable in the control panel. Within the network cabinet or control panel, best practice is to always leave several loops of spare cable so that future repairs or relocation of the cabinet is possible. Fibre cables cannot be easily spliced, so having extra “maintenance loops” of cable makes future work easier. In fact, for fibre optic service providers it is not uncommon to leave 10 – 20 m of extra cable inside cable vaults. The process of terminating fibre cable strands is defined by the cable manufacturer. Specialized tools and equipment, including a splicing machine, are typically used. First, the outer jacket of the fibre cable is removed, followed by the plastic tube covering the fibres. Then, the individual fibres are exposed and wrapped around a jig. To prepare each fibre, a “boot” for a fibre connector is fed onto the wire and pushed down. Then, a pair of fibre strippers is used to remove the outer jacket and any remaining inner polymer coating. A coating of fibre optic cleaning fluid is then applied to the now exposed fibre, using an appropriate fibre-cleaning material. A device called a cleaver is then used to make a precision trim on the end of the fibre. This trim has to be perfectly perpendicular, or the light won’t shine into the connector properly. Next comes the splicing of the fibres. Splicing will usually be done one of two different ways: mechanical splicing or fusion splicing. For fibre terminations, mechanical splicing is often used as it is the fastest and easiest to install. For long distance applications, fusion splicing is more common. Mechanical splicing begins by placing the connector into a cradle on a splicing machine, and then inserting a termination coupler into the machine. A visual-fault-locator tool on the splicing machine then indicates if the splice is in alignment. If so, a green light will come on and it is safe to proceed. If not, the fibre end will have to be cut off and re-prepared. The next step with the splicing machine is to insert the freshly cleaved fibre into the hole at the bottom of the splicer. While keeping some pressure on the fibre, the technician presses a button on the machine and the machine proceeds to complete the splice into the coupler. Once the coupler is attached, the “protective boot” for the connector is slid into place and the coupler placed into the correct part of the termination box. For termination connectors there is a wide range of available connector types, including ST, SC, FC and LC connectors. The correct type of connector to use depends on the type of network equipment being used. Adapter fibre patch cables are also available if there is a connector type mismatch. After the strands are terminated, the next step is to finish mounting them into the termination box, close up the box, and ensure the entire fibre cable, including maintenance loops, is well secured and protected. If there are multiple fibre cables going into a termination box, the cables and the fibre termination jacks need to be labelled. The last step is to test the newly installed fibre. Usually an end-to-end fibre test meter is used, which consists of a sender module at one end and receiver module at the other end. The test meter will send test light signals down the cable and look for distortion and attenuation of the signal. If the cable performs within manufacturer specified acceptance criteria, then the installation is certified as compliant. If the test does not pass, remedial work is needed. For most fibre installations, cable manufacturers will provide an installation warranty, provided that the cable has been installed by certified technicians using approved termination products and methods. Make sure to ask for copies of the fibre installation test reports and a copy of the manufacturer’s warranty paperwork. Connor Campbell is a computer science student at the University of Guelph. Graham Nasby is with City of Guelph Water Services. This article appears in ES&E Magazine’s February 2018 issue.